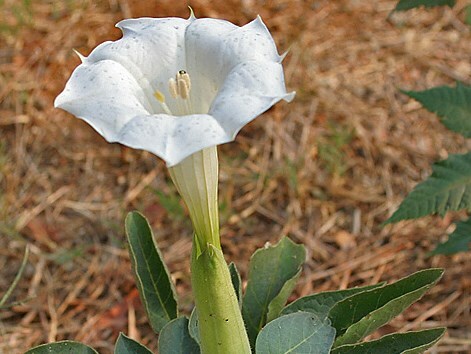 Datura inoxia (pricklyburr) is a herb/ (family Solanaceae) with large white flowers, broad leaves and prickly fruits found in the south and central western ranges of California. It is native to Mexico and Central America. It favors dunes and grasslands. It spreads via seed and rhizomes. Seeds are dispersed via ants, birds, animal fur and water.